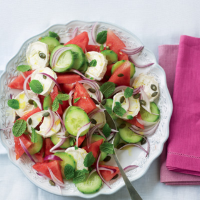 Sweet and juicy watermelon is the perfect partner for the tangy, creamy goat’s cheese in this simple but vibrant summer salad. 1. Arrange the melon, cucumber and cheese on a serving platter. Scatter over the red onion, mint leaves and pumpkin seeds. 2. Whisk together the rapeseed oil and lime juice, and drizzle over the salad. 3. Grind over some black pepper and serve with toasted bagels.